Picture an old television. On top of that old TV is probably a nice pair of rabbit ear antennas. Now picture your new modern smart TV hanging on its wall mount. What if we told you that you can use modern versions of an antenna to get free cable channels on your TV without breaking a single law? This page explain why you can get some channels and walk you through the steps to get as many free cable TV channels as possible. What cable TV channels can I get for free? Prior to 2009 TV channels were transmitted in analog before they were received by an antenna, translated by the TV, and displayed on the screen as a TV show. However, after 2009 the broadcast towers switched from analog to digital signals. Luckily for cord cutters, a law in 2007 made it so that all future TV’s manufactured were required to have a digital tuner that could translate these new digital signals. You probably had “cheap” cable or satellite TV at the time and likely didn’t even notice the change from digital to analog. Notice it or not, it was a huge change that great increased the picture quality of these channels. They’re still free and completely legal to pick up and your antenna options have increased a hundred fold. Similarly to 2009, we’re on the cusp of a huge change for over the air channels. The FCC approved 4k signals to be offered and they should start rolling out sometime after the spring of this year. Not only can you get HD channels today, an antenna might even be able to pick up 4k channels in a few months! What most people don’t know about over the air cable is that the picture quality for these channels is actually higher than you get through paid cable services because the picture isn’t processed like it would be through a cable box. The free cable TV channels available to you are completely dependent on your location which means you can’t pick up everything for free. Some of the bigger channels that might be available in your area are as follows. Keep reading to find out what you have to do to see your channel availability and which antennas will help you get the best results for your situation. As we said above, free over the air channels are dictated by your location. The distance to a signal tower as well as any obstructions between it and you will greatly impact your ability to get certain channels. Thankfully, there’s a way to find out what you can get without buying an antenna first and playing “guess and check”. The best place to get that information is from TVfool.com. We recommend using TV fool because if you run into any issues or can’t understand something, it’s easy to share with others. You can generate a TVfool report and then share the URL to show the report to other people. The report is incredibly dense with information but, don’t be scared, we’ll walk you through how to read it! Once you navigate to TVfool.com, click on TV Signal Locator on the left hand side. Enter your address in the address field and then enter a height for your antenna. Try and enter a realistic height for where you might consider putting an antenna, but if you aren’t sure just put in 25′ for now. Once you enter your address and a height, click on the Find Local Channels button and you’ll get your report. Your report should look like picture above. It looks pretty intimidating, but if we break it down into small parts it starts to make a lot more sense. Let’s start from the top and work our way through the report. Let’s start with the big colored table in the middle. This is the channel information table and includes information on each signal that you could potentially pick up based on the location you entered. Our report above shows 51 different signals that we might be able to get based on our Boston location. There’s a lot of numbers and acronyms though, so lets break down the table further. Callsign – This is the unique letter combination that the FCC uses to identify each station. Real – This is what the actual channel is, based on its radio frequency. (Virt) – This is the digital channel that might be displayed on your TV. Netwk – If the channel is associated with a major national network, it’ll be displayed here. As you can see, the chart for Boston shows the top 10 channels that we can pick up are all affiliated with major networks such as NBC, CBS, and NBC. Although you may be interested in some of the smaller over the air channels, most people are looking for these major news and sports broadcasts when they turn to an antenna as a way to cut cable . The next four columns on our channel information table is under the header =====Signal====. These columns are information about the strength of the signal and will dictate the picture quality of the channel if you can pick it up. NM(dB) – NM stands for Noise Margin and shows how much room there is for obstructions and signal interference between your location and the broadcast tower. Pwr (Dbm) – This column shows the Power, or signal strength of the channel for your location. Path – Path is broken down by a few acronyms that all show how exactly the signal reaches your location. LOS – Line of Sight. If you could see through buildings and hills, you could probably see the tower from your house. 1Edge – The signal is experiencing a reflection and even if the early what flat and barren, you probably couldn’t see it from your location. 2Edge – The signal is experiencing even more reflections off of hills, the atmosphere, or the roundness of the Earth. You might struggle to pick these signals up. Tropo – The signal is very far and even some of the strong antenna’s might not be able to pick it up. The most important column from this section is the NM column. The Noise Margin is what dictates the colors of the rows and is a good indicator of the type of antenna you need. Green Row – Above 35 decibels – A typical indoor antenna should be able to pick it up. Yellow Row – Above 15 but below 35 decibels – A slightly larger attic antenna might be necessary. Pink Row – Between -5 and 15 decibels – You’ll need a larger roof mounted antenna. Grey Row – Below -5 decibels – It’s likely not worth the effort to try and pick these signals up. The last three columns will show you were the broadcast tower is located in relation to your home. You may think you drive by the FOX studio on your way home from work and know exactly where it is, but keep in mind that these are the actual tower locations, not the studio. Dist – The distance in miles to the tower. 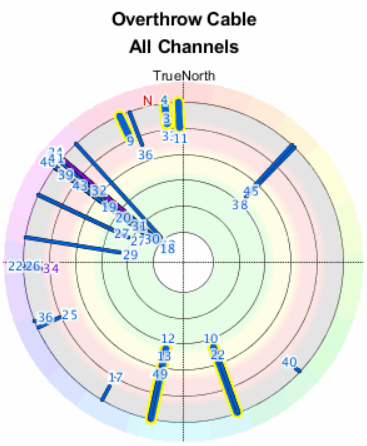 True – This is the number of degrees away from true north that the signal is. If you drew a straight line on a map from your location following the True degrees and the distance, you’d be able to pin point the tower. Magn – The True column is the degrees from true north on a map, but the Magn is degrees from north according to a compass. Magn stands for magnetic north. You’ll likely use a compass if you’re installing an antenna so you should be looking at the Magn column. Notice how different True north and Magn North are from one another. The 15 degree difference on our table could mean picking up a channel or not. Now that you understand the distances and direction the signal towers are coming from, the radar plot that is on your TVFool Report should make a lot more sense. TVFool puts your location at the center of the circle and shows all of the signals and their distances in relation to your home and true north. If the line is longer (the closer to the center it reaches from the outside) it means that the signal is stronger. 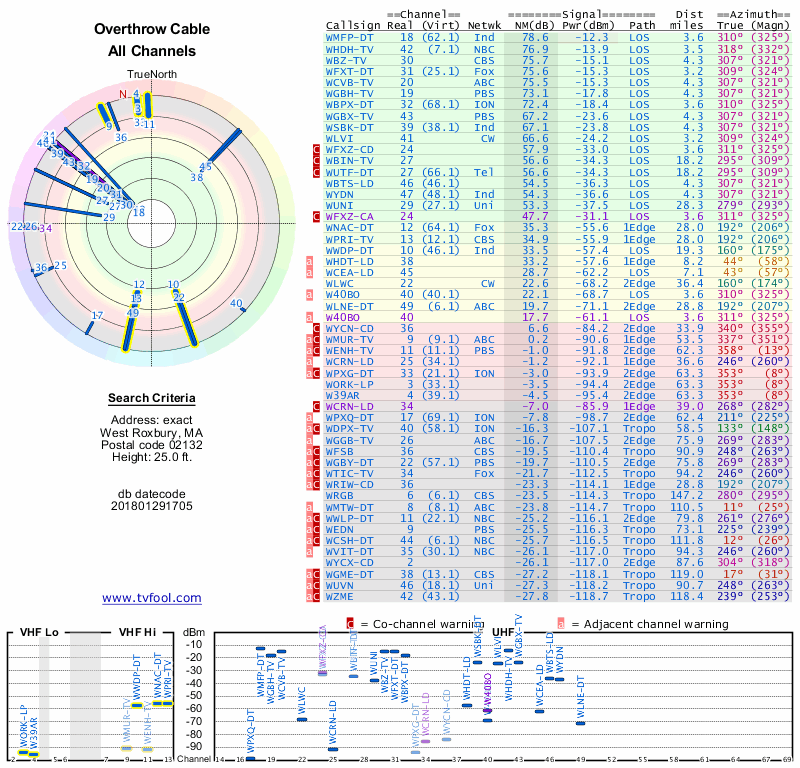 The table on the bottom of the TVfool report organizes the channels by their signal strengths. When you figure out which channels you want from the colored table above (CBS, ABC, etc), you should take a quick note of whether they fall into the VHF or UHF boxes on this table. Certain antenna may be recommended for UHF signal and have weaker performance with VHF or vice versa. Most modern TV’s don’t come with a TV antenna any more. If you want to pick up these over the air channels, you’re going to need an antenna. As you learned in the section above there are many different types of antenna that excel at different things. Typically, they are divided by antennas intended for indoor use and ones to be mounted outside. The greater the signal distance you need, the bigger the antenna. Sometimes, the signal at your home is strong enough that you only need a small indoor antenna and other times you need to go all out. Let’s take a look at our TVfool report notes. You should have a note if any of your channels that you wanted were not green which can help figure out the general type of antenna you need. Green Over 35NMdB An indoor TV antenna should suffice. If most of your signals are over 40NMdB you won’t need an amplified version. Yellow 15 to 35NMdB A strong Indoor or attic mounted antenna, typically with an amplifier. Red 0 to 15NMdB A larger and strong attic, or a roof/tower mounted antenna with a preamplifier. This section will give you an idea about each type of antenna. You can find more specific information about each type a little farther down in this article. Rabbit Ears – As we mentioned at the start of this article, rabbit ears are what people usually think of when they think of indoor TV antennas. They generally sit on top of, or beside, your TV. They are cheaper than other options and are extremely easy to set up, but the trade off is that they aren’t quite as effective as the other options. If your TVfool report shows that you have strong VHF signals with a path of LOS, you might be okay with this type of antenna. Loop Antennas – A loop antenna is exactly as you’d imagine it; a giant loop. They are mostly for UHF signals and are decent options for VHF signals. They come in a variety of sizes and shapes and sometimes have multiple loops linked together to improve signal. Loop/Rabbit Combo – As you can imagine, these combo antenna are slightly better than both a loop and a rabbit ear antenna. They do a decent job of picking up both UHF and VHF signal, but should only be used if your path is LOS. Bowtie Antenna – Bowtie antennas do what loop/rabbit combo antennas should. They do an okay job with both UHF and VHF signals and can be tuned. They have small metal bits called “whiskers” sticking of their sides that can be adjusted for tuning. Yagi – Yagi antennas are made for pulling in specific signals. These are highly specialized antenna and you probably won’t want of these unless you’re trying to Tropo signals. Unfortunately, there are a lot of external factors that can change the quality of your reception or if you can get a signal at all. Sometimes trees around your home, hills, or even the building construction can influence the signal strength you get. If you’re concerned about any of these factors, a cheap pair of rabbit ears might be worth it to test your signals before spending a lot of money and not getting what you want. Typically, any store bought antenna that is marketed at less than 35 miles are unamplified while those above 35 miles have amplifiers. If possible, you should avoid indoor antennas that have built in amplifiers. In some cases you might find yourself in a situation that you think need an amplifier, but you’re probably better off using an attic or outdoor antenna rather than adding the amplifier to an indoor antenna. Amplifiers can sometimes be more of a headache than a help. For example, if you’re too close to a tower, an amplifier or pre-amplifier can have negative effects on your signal by causing it to be too strong. An example of an amplifier that can be added to an unamplified antenna. 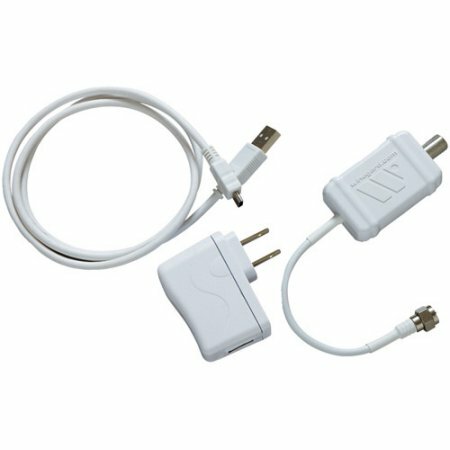 The Winegard LNA-100 boost Ultra Low Noise TV Antenna Amplifier from Walmart. The Mohu Leaf 30 is an unamplified antenna compared to the Leaf 50 that is amplified. The Leaf does a much better job receiving UHF signals than VHF channels. The Mohu Leaf 30 comes with a lack-luster RG-59 coax cable and should be swapped with a RG6 to improve reception. This article explains the significance between these two types of coax cable if you’d like to read about it further. 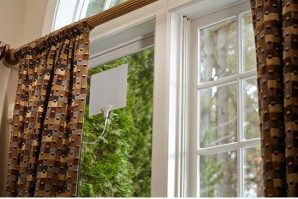 The image below shows how the Mohu Leaf 30 looks when it’s mounted to a window. It can also be wall mounted if the wall is facing the proper direction. The Winegard Flatwave is similar to the Mohu Leaf in design. It is flat and intended to be mounted to a window or on a wall facing the direction of the signal tower. It receives both UHF and VHF channels and typically gets VHF-HI channels better than other indoor TV antennas. It’s available on Amazon and is typically also sold at your local Home Depot. If you’re expecting to have to test multiple different antenna, being able to return it at a Home Depot is a nice plus. If you’re in a location like our example that has a lot of channels really close, Winegard also sells micro or mini models. You can purchase the Winegard Flatwave on their website here. The Winegard Freevision is an indoor/outdoor/attic antenna that is intended to be hung from a nail or mounted on a pole. Unlike the Winegard Flatwave, the Freevision is not flat and requires some assembly. Like the Mohu Leaf 30, we recommend purchasing an RG6 coax cable because the Ffreevision doesn’t come with one of its own. It is more directional than the Flatwave, but also does better with both UHF and VHF signals. It’s slightly more expensive than the Flatwave, but still sits below $35 on Amazon and at Home Depot. 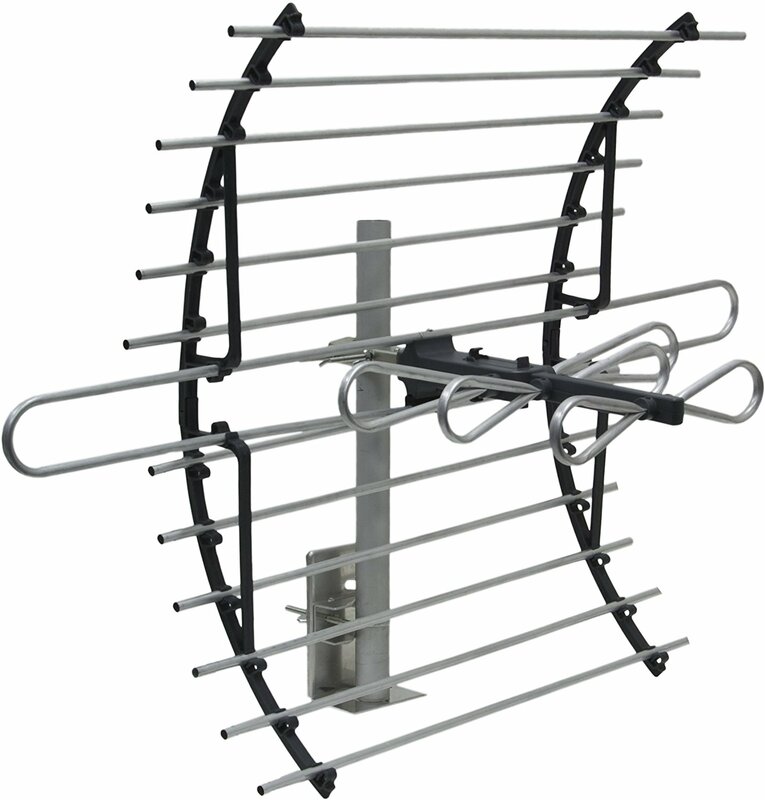 If your TVfool report has channels marked green, this model of antenna is a great indoor, outdoor, or attic option. The Clearstream 1V is an antenna that can be set up in three different configurations. The base is convertible and allows you to use the antenna on a table, on a wall, or on an outdoor mount. According to the manufacturer, this antenna is “ideal for urban and suburban areas where heavy foliage or roofing materials reduce the incoming signal. Dedicated UHF and VHF multi-directional elements deliver range and reception in less than ideal locations.” The Clearstream 1V should have a greater range than rabbit ear antennas, but is also a little more bulky. Keep in mind that the Clearstream 1V is different than the Clearstream 1 (only UHF). It’s possible to purchase a retrofit Kit to get VHF channels with the Clearstream 1, but you’re usually better off just getting the 1V. If rabbit ears aren’t enough and you’d prefer not to use an attic or outdoor antenna (perhaps in an apartment), the Clearstream 1V is one of your best options. The Clearstream1V shown using the attic mount base and mounted to a stud in an attic. The obvious benefit from an attic antenna versus a typical indoor one is the height advantage. 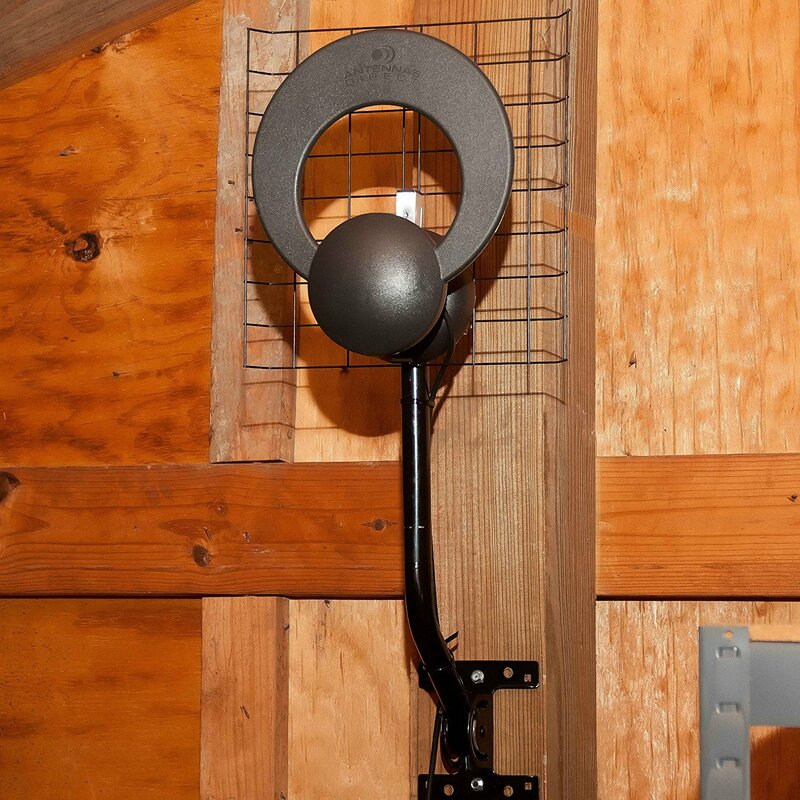 Unlike an outdoor antenna, mounting it in your attic means you don’t have to deal with it being exposed to the elements or being impacted by storms. Like an indoor antenna, you still have to deal with the signal being impacted by building materials such as metal ducts and radiant barriers. Sometimes, lots of electrical wiring and HVAC equipment or lighting found in an attic can conduct electrical noise and block your signal. An attic antenna is a middle ground between the lower strength of the indoor antenna and not having to climb on your roof to fix a shifted outdoor antenna in the middle of a snowstorm. The following sections are brief outlines about some common attic antenna. We’ve written a comprehensive guide for the best attic antenna of 2018 if you’d like to learn more about specific brands and see our recommendations. This antenna by GE has 4.5 stars on Amazon with over 1,100 reviews. It is approximately 29″ wide and 21″ tall and comes on a small pole and mounting bracket. It’s intended to pick up both VHF and UHF channels and comes with a lifetime warranty. If you have access to your attic and don’t mind the slightly more complicated install of an attic antenna than an indoor one, the GE 33692 is a great option. It’s cheaper than some of the indoor antennas and because it is larger and mounted higher, your signal should be better. The biggest complaint with this particular attic antenna is the build quality. The antenna ships in a relatively small box and in about 50 pieces making install a little difficult. However, because the antenna is still inside your home and not exposed to the elements, once you set it up it should be good for a long time. Outdoor antenna are not necessarily better than indoor or attic antennas, but do provide some advantages. Outdoor antenna are typically more powerful than attic mounted or indoor ones due to the availability of space. You can usually put a much larger antenna on your roof than you can fit in your attic. Another advantage of an outdoor antenna is height. Ultimately, height plays the most important role in TV antenna installation. A higher mounted antenna is clear of obstructions that can break up a signal enough to make your reception shaky. Mounting one to a tripod mount and mast, you can get over 10 additional feet of height above your roofline. This additional height can make the difference between a clear or an obstructed signal. A majority of the United States has most (if not all) of their channels as UHF and maybe one or two in VHF-high. If you fall into the category of having one or two VHF-high channels, this is the section of outdoor antenna you should be looking at. If size is a concern for you, please note that the VHF-high signal typically requires that the antenna be larger than the UHF type versions. If you’re signal strength for the channels you’re looking for are on the higher side, you can get one of these lower gain antenna. They are smaller than the higher gain versions and are better if appearance or space are an issue.